While cleaning your yard you don’t wish to disturb your neighbors. Choosing a leaf blower which runs quietly will see you avoid noise pollution. For high maintenance gardens, high power is needed. That’s especially true if you have many trees on your compound and you have lots of wet leaves to clear. In that case, go for higher airspeed and flow ratings. This electric leaf blower review gives you our top two picks to consider. We landed these two models based on their overall performance and the user feedbacks. These are three machines combined into one unit; blower/mulcher/vacuum and weighs 10.8lbs. As an electrically powered garden tool, it gives a clean job free from smelly fumes or gas. Moreover, it requires very minimal assembly; just attach the tube and the mulching bag and you are set for a single-handed blowing or vacuuming. It’s powered by a powerful 12-ampere motor and features 2-speed levels. Due to the powerful motor, the blower/vacuum/mulcher moves a 400CFM volume of air at the rate of 250mph.cleaning your driveways, patios or decks then becomes easier using WORX WG518. Using the aluminum impeller the unit acts as a powerful mulcher which can shred 16 bags of leaf into one bag. In addition, it has a 1-bushel mulching bag that’s easy to carry owing to its straps. The Toro 51618 assumes three roles; a powerful blower, a leaf shredder, and high-speed vacuum. Besides, it weighs 7.2 pounds hence providing the single-handed operation. It’s powered by a 12-ampere motor that supports two speeds. The variable speed provides for better control during the blowing or vacuuming. Owing to the powerful 12-ampere motor, the Toro garden tool drives airspeed of 230 mph. At that airspeed clearing large leaves and sticks becomes a walkover. As a leaf shredder, it promises to condense 81 percent of mulched leaves to ½ inch. The quick release latch gives simple conversion from blowing to vacuuming mode with no tool. As a leaf shredder, it’s efficient enough to reduce 10 bags of leaves to just one bag. 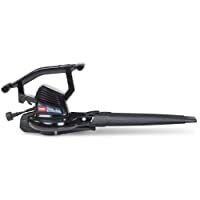 From the electric leaf blower review, the two brands have a high mulching ratio and combine 3 roles into one unit. Moreover, their variable speeds become convenient when collecting leaves into a pile.